Connor Hellebuyck wasn't laying any blame for missing out on a shutout in his first NHL playoffs by 45 seconds. The Winnipeg Jets goaltender was just glad Paul Stastny, Andrew Copp and Patrik Laine scored in the third period to propel the team to a 4-1 win over the Minnesota Wild on Friday. The victory gave the Jets a 2-0 lead in the first round of their NHL Western Conference best-of-seven playoff series. "Yeah," Hellebuyck said when asked if he was disappointed in not posting a shutout. "But you know what, we got the win and that's all I care about, especially this time of year. The guys played so well in front of me, there's no fault." Wild forward Zach Parise scored his second goal of the series when he deflected a Mikko Koivu shot past Hellebuyck at 19:15. The goal came on the power play after Jets forward Brandon Tanev was called for hooking with 59 seconds left. Hellebuyck made 16 saves. Devan Dubnyk stopped 40 shots for Minnesota to go along with Wednesday's 37. Jets defenceman Tyler Myers had a goal in the second period and also picked up an assist. Laine added one helper and rookie forward Jack Roslovic, replacing injured veteran Mathieu Perreault, had a pair of assists. Winnipeg won 3-2 on Wednesday, with Game 3 going Sunday at Xcel Energy Center in St. Paul. If it begins similar to the way Friday's ended, it could be a wild match. "We stuck up for each other," Wild centre Eric Staal said. "We're going to do our best to make this a series and compete. We're going to come home in front of our fans and be ready to play Game 3." It was in contrast to the way they started the scoreless first period, surpassing the four-shot total they had in Wednesday's opening frame with five by the five-minute mark. That included three shots at Hellebuyck during a power play with Myers in the box for tripping. Winnipeg got its first power play five minutes into the second when Jets centre Mark Scheifele was tripped by Wild defenceman Jonas Brodin, but it wasn't their shots with the man advantage that sparked the crowd. 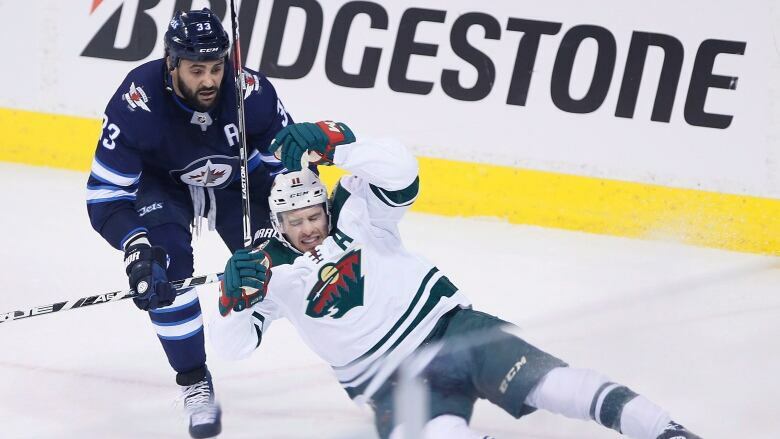 Jets defenceman Dustin Byfuglien threw two big hits nine seconds apart, the first on Wild forward Mikael Granlund in front of the Winnipeg bench, the second a slam that rocked Koivu into the boards behind Hellebuyck. "Unfortunately, I didn't get a good look," Hellebuyck said with a chuckle of the Koivu hit. "I'm definitely going to be looking at the replays because the crowd went nuts." Winnipeg only got one shot on goal on the power play, but the momentum — and hits — carried on and Myers scored at 8:41 to make it 1-0. When the second period ended, Winnipeg had outshot the Wild 27-14 and were ahead 28-18 in hits. "He's just throwing his body all around the ice and it just gives us so much energy," Laine said of Byfuglien. "The crowd seems to like it, so we like it, too." Stastny and Copp scored 1:42 apart in the third, with Byfuglien sending a backhand to the front of the net that Statsny slapped in at 7:42. Copp made it 3-0 at 9:24 when he redirected in a Bryan Little shot. Laine fired in his second goal of the series from the right circle at 17:58. He also assisted on Stastny's goal.